Earning dollars need not be difficult. You don't need to leave your family behind. - Gateway to Canada | Canada Immigration Consultancy! Earning dollars need not be difficult. You don't need to leave your family behind. In the past, most Filipino Nurses are more inclined in pursuing an application to the US than Canada for two common reasons. First, processing period to immigrate to Canada used to be 3-5 years. Most Filipino don't want that, most of us want to board the plane right after we submit our resume for evaluation. Second, most nurses prefer that they have an assured job waiting for them. Not that many understand the concept and advantages of a permanent resident visa application. But this preference changed when hiring of foreign nurses in the US was put on hold. Ms. Ruby Calasag, a Registered Nurse, was one of them. She came to the office few days before the Ministerial Instruction identifying 38 high demand occupations and a promise of 6-12 months processing period. That time, I told her that the processing period may take about 3-5 years. She went home a bit disappointed. Imagine her surprise (or doubt?) when I gave her a ring less than a week after informing her that there were changes in the immigration regulations and that processing period may now be only 6-12 months! 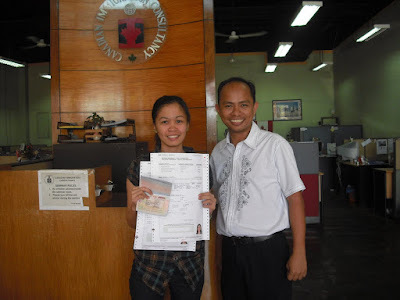 After explaining the changes and erasing all her doubts, she eventually signed up with us we were able to send her application to Centralized Intake Office (CIO) on March 9, 2009. A positive assessment from CIO on April 24, 2009. Her husband is currently working in Saudi, thus, it took them a while before finally completing the requirements, which were submitted to Canadian Visa Office in Manila on July 29, 2009. They received the approval and medical instruction on October 3, 2009. That's only two months and few days after submission of documents! But because her husband in working in Suadi and preferred to undergo medical examination in Designated Medical Practitioners in Manila and that it took him a while to get the Saudi Police clearance, there was a delay in the issuance of their visas, which were issued early this month. They will be moving to Canada this April 2010. They will no longer have to be physically separated just to earn a decent income. Clearly, permanent resident visa application is way better than being an overseas contract worker. You don't need to be separated with your love ones just to earn in dollars.